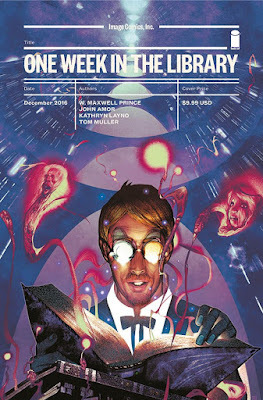 NEGROMANCER 2.0: Image Comics to Give Readers "One Week in the Library"
Image Comics to Give Readers "One Week in the Library"
Writer W. Maxwell Prince and artist John Amor (Judas: The Last Days) bring an original graphic novella, ONE WEEK IN THE LIBRARY, to Image Comics this December. ONE WEEK IN THE LIBRARY is an experimental graphic novella which recounts a troublesome week in a magical Library via seven short stories—one for each day—that use comics, infographics, prose, and poetry to play with the graphic medium and explore the multivalent world of living narrative. Welcome to the Library. It’s here that every story ever written is catalogued and monitored by a single man, who’s begun to notice something strange: the books are rebelling. ONE WEEK IN THE LIBRARY with cover art by Frazer Irving (Diamond Code SEP160780) will hit comic book stores on Wednesday, December 7th, 2016. The final order cutoff deadline for retailers is Monday, October 24th, 2016. ONE WEEK IN THE LIBRARY trade paperback (ISBN 978-1-5343-0022-4) can also be pre-ordered on Amazon, Barnes & Noble, Indiebound, and Indigo. VIZ Media Delivers Supernatural "Platinum End"
Image Comics Announces a Hit "Eclipse"
Snoop Dogg to Be Honored at BET "Hip Hop Awards"
Frank Miller Covers Image Comics' "Moonshine #1"
Image Comics Offers "Violent Love"